On June 28th we reported the launch of the 40.8m motor yacht Scorpion from Italy's Sanlorenzo yard and now I learn she's for sale through Mario Velona at Ocean Independence. The 6th hull of the Alloy 40 series designed by Francesco Paszkowski and built to ABS class, Scorpion is powered by twin 2,340kW MTU engines giving a top speed of 28 knots and a cruising speed of 26 knots. Accommodation is for 10 guests in five cabins plus six crew. 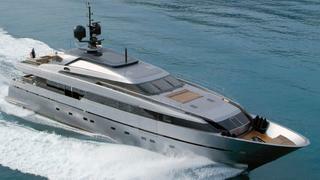 Scorpion is asking €18.9 million.